In 10-inch skillet, cook beef and onion over medium heat 8 to 10 minutes, stirring occasionally, until beef is thoroughly cooked; drain. Stir in hot water, milk and contents of uncooked pasta and sauce mix pouches (from Hamburger Helper box). Heat to boiling, stirring occasionally. Reduce heat. Cover; simmer about 10 minutes, stirring occasionally, until pasta is tender. Remove from heat; uncover (sauce will thicken). 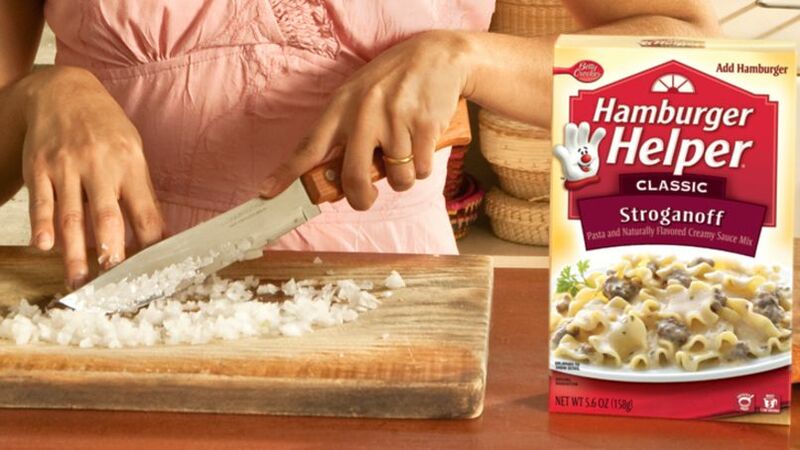 Enjoy this delicious beef and onion stroganoff that’s made using Hamburger Helper® stroganoff – perfect for a French-style dinner.